The Co-operative store in Caister-on-Sea near Great Yarmouth is a convenient supermarket for residents and visitors selling all the essentials and groceries you will need with an ATM machine outside. On arrival in Great Yarmouth follow signs for the A149 to Caister-on-Sea, proceeding straight ahead at the mini roundabout just past Yarmouth Stadium and straight ahead over the next three roundabouts. 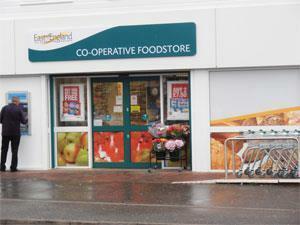 The Co-operative store is then located on the right hand side just opposite the Police Station.